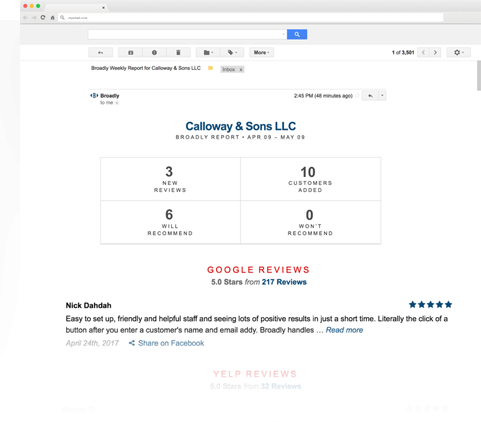 Broadly helps you get quality reviews and actively promotes your business on Google, Facebook, and other important review sites. Broadly is proud to partner and integrates with Jobber software. We bring preferred rates to members. Broadly now integrates with Jobber!  Our goal is to put your local business in the spotlight. Positive online reviews help your business stand out from your competition online, and are proven to get you even more business. 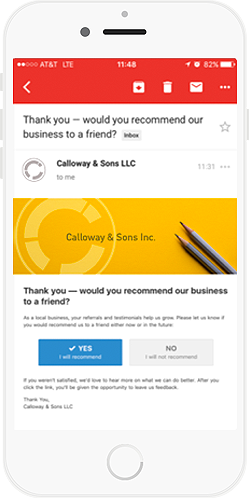 Broadly’s online review platform automates customer feedback with a one-click process, so you can focus on running your business. We ask your customer about their experience with you via a branded email or text, and then they’re only one-click away from leaving you a review. 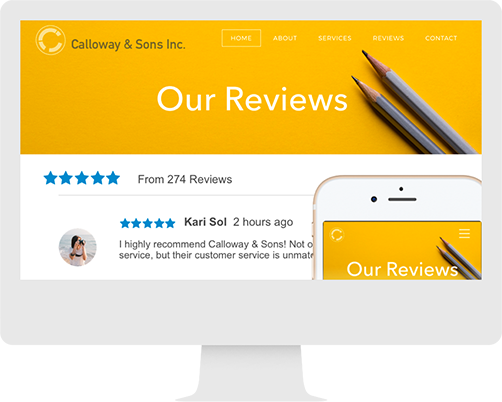 Broadly puts your online reviews directly on your website using our patent-pending code. This allows your website visitors to see the great work that you do right on your website. We’ll automatically publish all of your 4 and 5-star reviews from Google and Facebook on your website. Your review stream enhances your website’s SEO and updates your content to help you to appear at the top of local search result. Now all of your customer information is at your fingertips! 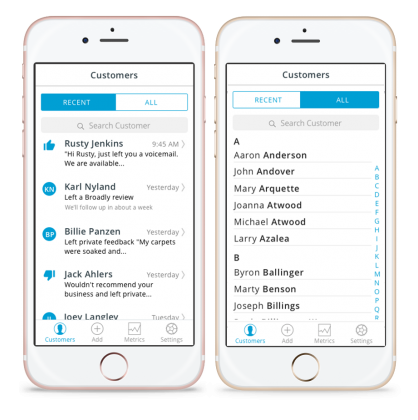 Broadly’s intuitive mobile app allows your team to engage with customers on-the-go. Access customer information, request feedback, monitor reviews, and assess team performance everywhere you go. Whether your employees are out in the field or at a desk, your team can manage your online reputation from any device, in real-time. 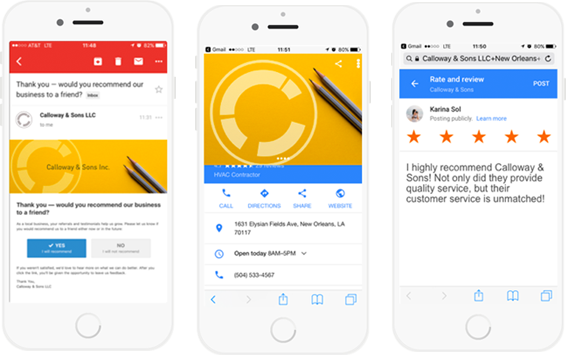 For Broadly businesses that have team members in the field or on-site, multiple vehicles, or mobile technicians, our app enables your team to send feedback requests on-the-go. A timely request for feedback sent after a completed job enables us to maximize your potential for great reviews and high star ratings. 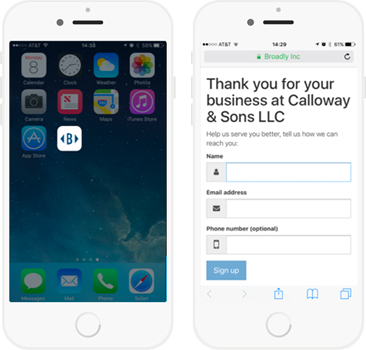 Broadly’s customer success team will help you install the app on your smartphone (Android or iOS) or tablet. This way, you can easily track how your business is doing, and use customer feedback to make improvements along the way. How many new customers you’ve seen that week.  Number of new reviews you’ve received and where. How many customers will recommend your business to others. Broadly is a five-star business, and our goal is to make sure you are successful. Quarterly marketing campaigns targeted at new and existing customers. 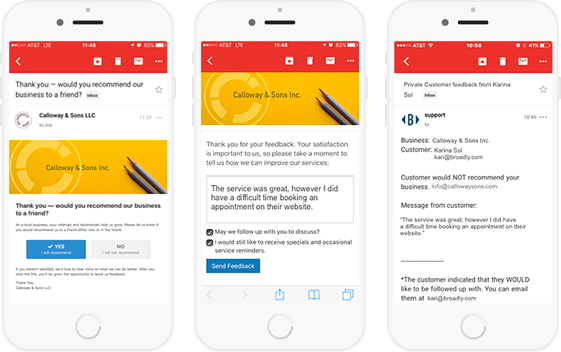 Broadly enhances your business processes to automate customer feedback. We integrate with business management systems, accounting and invoicing systems such as Quickbooks(™) and Jobber. 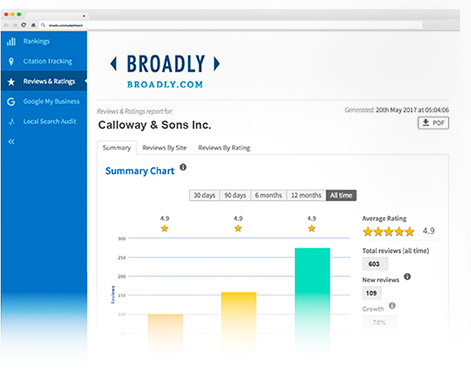 Broadly makes it easy for multi-location businesses and franchises to monitor, manage, and respond to their online reviews from a simple dashboard. Get an assessment of your business's online presence. See a sample report of new reviews, new customers, and a breakdown of where those reviews are listed. Learn how your business could look online when partnered with Broadly. Business owners tell us that referrals are their best source of new customers.